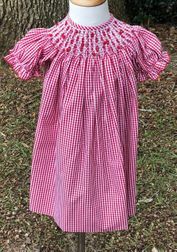 A lovely flowing smocked dress for Christmas, Christmas pictures, card pictures and gatherings. 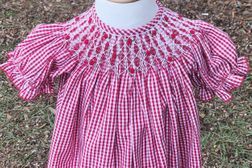 It is made by Delaney in red gingham and bishop smocked. The smocking is hand embroidered with bullions/rosebuds and geometric designs.